The TigerChef 90-Piece Disposable Buffet Chafer Set with Serving Utensils contains all the food warming and serving utensils you will need to set up 9 complete chafing dish stations to serve your signature dishes in style. Perfect for catered affairs, corporate kitchens, tailgate parties, graduation parties, and residential use, this disposable buffet chafing dish set with serving utensils has it all. This chafing dish set is simple to set up and just as easy to dispose of at the end of your event. It includes 9-wire chafing racks, 9-full size foil pans that serve as water pans, 18-half size foil food pans, 18-lids plus 9 sets of chafing fuel gel.. The water pans and food pans slide easily into the racks for fast set up, and the gel cans fit neatly into the wire rack at an adequate space beneath the water pan to keep your food warm and inviting. With this complete chafing set, you can keep food warm and ready to serve at any type of venue. This set also includes a full set of serving utensils, including 10" serving spoons, 10" serving forks, 10" slotted spoons as well as serving tongs. The fuel cans included are water soluble, biodegradable, non-toxic and.each burns up to 2 hours. They are also easy to light and spill free for added safety. In addition, the high quality aluminum foil pans and sturdy plastic serving utensils won't bend, sag or break and will maintain their high quality throughout your event. 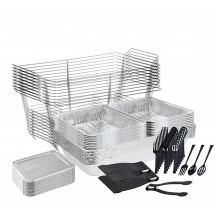 The wire racks, pans and lids are also easy to stack and store for use as needed. 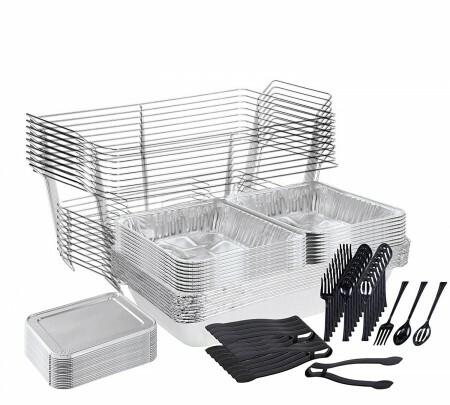 The wire racks can also be reused with a fresh set of pans if desired. Perfect when extra chafing equipment is needed, or for use at any type of outdoor party, home reception, or other catered event, this economically-priced 90-piece disposable chafing dish set is a smart item to add to your catering repitoire.. Item works great and quick shipping! The product was exactly what I ordered, the price was excellent, and the delivery was quicker than expected. With that being said thank you so much!